Thanks to Sue Carson, St James Anglican Church, Dundas and Co-Chair of Greening Niagara Diocese! Notes from March 1st, 2014. Divestment issues. March 1st – Sue attended The Green Awakening Network Forum in Toronto. 4 excellent speakers suggesting ways to divest out of oil companies. There has been a Christian history of divesting from products – tobacco, alcohol, weapons etc. 1. If there is grave large scale harm being done by a company or government policy. 2. Intractable resistance by industry or govt. that refuses to change. 3. Need to redefine society’s moral code. Actions: Reinvest –don’t just protest. Stop making the problem worse. Look at our churches energy footprint. Commit to be part of the solution. Talk about money/morals. Jane Ambachtsheer – partner in Mercer investing consulting business based in Toronto. 1.The Stern Review 2006 (Sir Nicholas Stern) The economics of climate change. 2. Climate change scenarios 2011 – implications for strategic asset allocation. Seven suggested areas as to where to invest instead: Alternative energies, Energy efficiencies, Water infrastructure/technologies, pollution control, waste management, sustainable resources and environmental support services. Is solar too expensive? In 1977 it was $75 a watt, now 72 cents a watt. Price dropped because of advanced technology – could drop more. Since 2008 50% drop in price. He went through all the types of hydro, coal, nuclear etc. Solar has to make sense – cheap, renewable. Easy to find rooftops so can be produced where it is needed in cities. We need to be pushing people to make BIG life changes and not just focus on the low hanging fruit (recycling/eating organically). We have to stop being polite and get engaged and be disruptive in all areas. Draw strength from other groups that are working on the same ideas. At 29 she will see the results of our action (or inaction) in her lifetime. Working on U of T. divestment. A post-doctoral fellow at the University of Toronto is working on a project studying faith-based organizations doing environmental work in Canada. Through this project, she is hoping to gain a better understanding of their work and the theologies and worldviews that drive and shape it, as well as some of the advantages and challenges of doing this work with a faith-based approach. This research will hopefully shed light on the important work being done by these organizations, and also provide them with useful information to help them evaluate and improve their programs. The project is funded by the Social Sciences and Humanities Research Council. Please contact Joanne Moyer for more specific information joanne.moyer@utoronto.ca or 416-978-6484. Mushroom Workshop: Back by Popular Demand! This event has been sponsored by Grace Lutheran Church and Greening Sacred Spaces at Environment Hamilton. This event will consist of an approximately one hour powerpoint presentation and hands-on demonstration of the proper methods, techniques and materials necessary for successfully cultivating and propagating delicious, nutritious edible mushrooms out of easily accessable and/or waste materials. This will be followed by a brief question and answer period. A suggested $5 donation will help to support future presentations and workshops in your community centered around similar topics including upcycling waste materials, encouraging local food consumption, nutrition and environmental sustainability. Your generosity is greatly appreciated. Environment Hamilton AGM with Guest Speaker Dr. Laurence Parker to talk on bee-biodiversity. Annual General Meeting: March 18th. 7pm. All welcome. Hamilton Room. Central Library. 55 York Blvd. Hamilton. 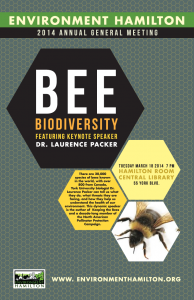 KEYNOTE SPEAKER - Dr. Laurence Packer (York University) will speak about bee biodiversity. Packer is the author of Keeping the Bees and is a decade long member of the North American Pollinator Protection Campaign.